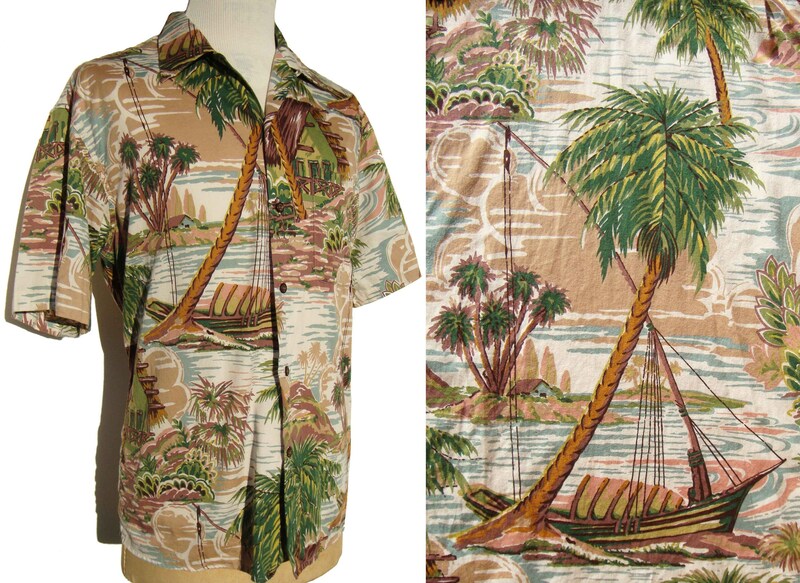 A balmy beach scene with swaying palm trees is featured in this vintage Hawaii themed aloha loop shirt by Reyn Spooner, circa 1990s. The tropical novelty print men’s shirt consists of a soft Egyptian cotton fabric, with scenic print of trees, palm fronds, wooden outrigger canoe, and modest hut, in soft muted earth tone colors of cinnamon and maple brown, coral, teal blue, and shades of green. The shirt has short sleeves, pointed notched collar with button loop, single patch pocket, and button down placket with genuine coconut shell buttons. There are three labels, including an embroidered one for “Egyptian Cotton”, another for “Reyn Spooner Hawaiian Traditionals”, and a size tag of “L”, which includes “Tailored in Hawaii of Imported Fabric”. Please note additional measurements as follows, and be sure to allow for ease.